We specialise in converting 3.5t vans (specifically Renault Master/Vauxhall Movano) into horseboxes, although we can also convert other vehicles from a panel van upto a 7.5t lorry. 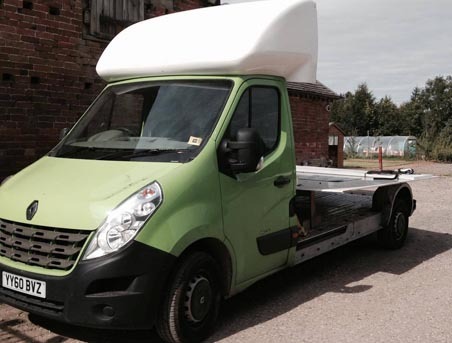 We can supply the van to be converted, or if you already have a suitable vehicle, we can convert that. All GC Horseboxes conversions can be tailored exactly to your requirements. 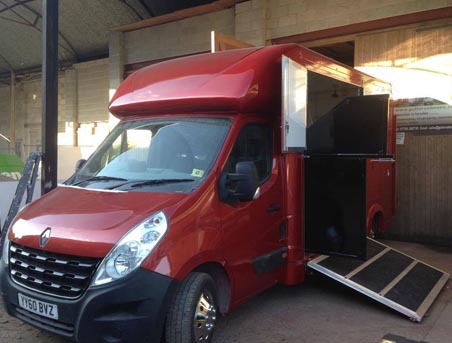 Our standard horsebox conversion will comfortably accomodate 2 horses, with easy access from a heavy duty drop down ramp incorporated into the side of the horsebox. The rear of the horsebox is accessed via a single door, providing ample space for all your equipment storage needs. If you feel the need for some luxury, the cab interior can be specified with leather seats, upgraded sound system, sat nav, mobile phone handsfree kit and anything else you might require. We pride ourselves in our after sales service. All of our horsebox conversions include a 12 month warranty and if you bring your horsebox to us in the first 12 months, we'll give the conversion a free check-up. In the unlikely event of any problems with the horsebox conversion, we'll make any necessary improvements at no extra charge. Whether you've purchased a horsebox from us or not, we can take care of all your horsebox maintenance needs.